Our photo products are captured on professional-quality gear that enables you to print anything from a 4x6" print to a billboard if you really wanted to. And with so many photos (we provide many photos typically to our clients) the experience of deciding what to print and how to print it, and with the variety of print products availale these days, you can become quite overwhelmed. When Does Quality Matter? The answer is size for the most part. If you are just looking to print small 4x6 prints, size is a lot less important and most outlets will give you a quality and value and would appease most clients. But we have seen cases when customers have printed from the local CVS pharmacy and hated the result. The difference is simply this. Many low-cost outlets are using high-end copiers to print your photos, where other outlets are using very high-end printing machines that are made for printing professional-quality images. And there is a huge difference. I am over-generalizing....but there are two extremes here. 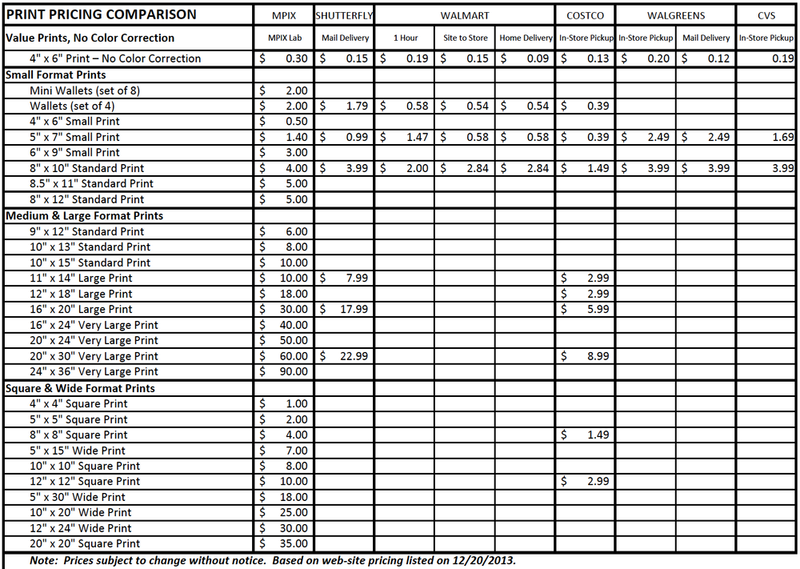 When you go to your local pharmacy for prints, or even Walmart or Costco, you are going to pay less ($0.09/each from Walmart as an example for a 4x6 print). And in many cases, the quality will be fine. But most of these outlets are doing a simple print from disk process with an average printer and a fairly average skill level monitoring and delivering the product to you. The printer is typically a high-end copier in many cases and the control process is all automated and basic. This is in comparison to a professional quality printer like MPIX, which is what you would get when you buy prints from my website directly. These prints are printed off of professional-quality printers and are managed by a technician who ensures the prints are color-correct and perfect. But you pay more for this level in quality. In many cases, on a set of 4x6 prints for mom, quality is not that big of a deal. However, I have seen horrendous stuff from some small pharmacy print shops...even in small 4x6 prints simply because the process offers very little quality control. So buyer beware. I am all about saving money, but just know when it's OK to do that. Personally there are times I just need quick and simple 4x6 prints and I will go to Walmart. You can't beat the price @ $0.09/each. But even when I order from Costco or Walmart I don't even get the prints delivered in the same order half the time. They come in an envelope with a stack of prints that are essentially run through a fast process and handed to me over the counter. And sometimes, that is fine for me. But if quality does matter, especially if you are printing larger prints (5x7, 6x9 and bigger)....the quality will become much more important and there are a variety of options out there. I highly recommend buying your larger prints directly from my website in these cases. The prices are higher, but not by that much. And the quality is astounding. We are talking about perfectly printed images, color-correct, cut and delivered in order, in high-quality packaging and with the greatest attention to detail and care. I have had customers contact me and say that they have printed photos that look green or lack clarity, and 100% of the time...they bough them from a low-cost pharmacy or print source. We deliver a high-quality print product to our clients, and we recommend that you get the best quality prints you can afford to benefit from your investment. I maintain a worksheet that includes print pricing and sizes from a variety of sources including MPIX (my website) so you can compare and make the best decision. Please feel free to ask me for this document. I typically include this when I send my clients their web gallery but I am happy to share it with anyone that is interested upon request. MPIX (our website) is super high-quality prints, color correct and delivered with the utmost care. This is a must for larger prints 6x9 and above. These prints are the best money can buy. You can buy these by clicking the BUY button above any photo in your web gallery from Brett Werner Photography. Shutterfly, Snapfish and similar vendors are all about prints and do a good job for reasonable prices. Larger prints are decent quality as well. In the more affordable range you can go to Costco and Walmart. Very low price, and often times fine with 4x6 sizes. But we are now in the buyer beware zone. You are on your own at this point, so take care with how your prints look. I strongly recommend you avoid CVS and Walgreens for prints. These shops mean well but are problematic for photographers like me. I have so many customers that have had bad experiences with these outlets. Colors are off, no quality control and we are essentially using a low-quality printer to make prints of photos captured on professional-quality gear. Print formatting is important. A camera (like my Canon 5D Mark-II/III) takes a photo in 2x3 ratio. So if you print a 4x6, 8x12, 12x18 etc, you will see the full picture as it was created in your JPG files. If you purchase a 5x7 or a 10x14, you are no longer printing a photo that is 2x3 ratio so the photo will be cropped. Many printing sites (including my own web site) allow you to do the cropping...but this may be automatic and some photos will be cut off so I recommend printing these sizes using a method that will allow you to do your own cropping.